يوجين فرانسيس Eugene Francis "جين" فاما (و. 14 فبراير 1939)، هو اقتصاد أمريكي وحائز على جائزة نوبل في الاقتصاد، اشتهر لعمله على نظرية المحفظة، وتسعير الأصول، نظرياً وتجريبياً. هو حالياً أستاذ كرسي روبرت ر. مك‌كورمك للخدمة المتميزة في المالية كلية بوث للأعمال، جامعة شيكاگو. حاز جائزة نوبل في الاقتصاد 2013 بالاشتراك مع روبرت شيلر ولارس پيتر هانسن..
اوجين فاما (يسار) يتسلم جائزة مورگان ستانلي - الجمعية المالية الأمريكية. فاما اسمه مكتوب في قاعة الشرف الرياضية في مدرسة مولدن الثانوية الكاثوليكية. وقد حصل على البكالوريوس في اللغة الفرنسية مع مرتبة الشرف الأولى في 1960 من جامعة تفتس حيث أختير أيضاً أبرز طالب رياضي. His M.B.A. and Ph.D. came from the Booth School of Business at the University of Chicago in economics and finance. At Tufts, he won the His doctoral supervisors were Nobel prize winner Merton Miller and Harry Roberts, but Benoit Mandelbrot was also an important influence. He has spent all of his teaching career at the University of Chicago. رسالته للدكتوراه، التي استنتجت أن حركات سعر السهم لا يمكن توقعها وأنها تتبع مشية عشوائية، نُشِرت في عدد يناير 1965 من Journal of Business, entitled "The Behavior of Stock Market Prices". That work was subsequently rewritten into a less technical article, "Random Walks In Stock Market Prices", which was published in the Financial Analysts Journal in 1965 and Institutional Investor in 1968. Fama is most often thought of as the father of the efficient-market hypothesis, beginning with his Ph.D. thesis. In a ground-breaking article in the May, 1970 issue of the Journal of Finance, entitled "Efficient Capital Markets: A Review of Theory and Empirical Work,"  Fama proposed two crucial concepts that have defined the conversation on efficient markets ever since. First, Fama proposed three types of efficiency: (i) strong-form; (ii) semi-strong form; and (iii) weak efficiency. They are explained in the context of what information are factored in price. In weak form efficiency the information set is just historical prices, which can be predicted from historical price trend; thus, it is impossible to profit from it. Semi-strong form requires that all public information is reflected in prices already, such as companies' announcements or annual earnings figures. Finally, the strong-form concerns all information, including private information are incorporated in price; it states no monopolistic information can entail profits, in other words, insider trading cannot make a profit in the strong-form market efficiency world. Second, Fama demonstrated that the notion of market efficiency could not be rejected without an accompanying rejection of the model of market equilibrium (e.g. the price setting mechanism). This concept, known as the "joint hypothesis problem," has ever since vexed researchers. Market efficiency denotes how information is factored in price, Fama (1970) emphasizes that the hypothesis of market efficiency must be tested in the context of expected returns. The joint hypothesis problem states that when a model yields a return significantly different from the actual return, one can never be certain if there exists an imperfection in the model or if the market is inefficient. Researchers can only modify their models by adding different factors to eliminate any anomalies, in hopes of fully explaining the return within the model. The anomaly, also known as alpha in the modeling test, thus functions as a signal to the model maker whether it can perfectly predict returns by the factors in the model. However, as long as there exists an alpha, neither the conclusion of a flawed model nor market inefficiency can be drawn according to the Joint Hypothesis. Fama (1991) also stresses that market efficiency per se is not testable and can only be tested jointly with some model of equilibrium, i.e. an asset-pricing model. In recent years, Fama has become controversial again, for a series of papers, co-written with Kenneth French, that cast doubt on the validity of the Capital Asset Pricing Model (CAPM), which posits that a stock's beta alone should explain its average return. These papers describe two factors above and beyond a stock's market beta which can explain differences in stock returns: market capitalization and "value". They also offer evidence that a variety of patterns in average returns, often labeled as "anomalies" in past work, can be explained with their Fama–French three-factor model. Risk and the Evaluation of Pension Fund Portfolio Performance. Park Ridge, IL: Bank Administration Institute. 1968. "Three Asset Cash Balance and Dynamic Portfolio Problems" (with Gary Eppen), Management Science (January 1971). "Risk, Return, and Equilibrium," Journal of Political Economy (January–February 1971). "Parameter Estimates for Symmetric Stable Distribution" (with Richard Roll), Journal of the American Statistical Association (June 1971). "Information and Capital Markets" (with Arthur Laffer), Journal of Business[dead link] (July 1971). The Theory of Finance (with Merton Miller). (Holt, Rinehart and Winston, 1972). These hyperlinks are available directly from Eugene Fama's home page. "Ordinal and Measurable Utility." In Studies in the Theory of Capital Markets, edited by Michael Jensen. New York: Praeger, 1972. "Components of Investment Performance," Journal of Finance (June 1972) DOI: 10.1111/j.1540-6261.1972.tb00984.x. “The Number of Firms and Competition” (with Arthur Laffer),  American Economic Review (September 1972). “Perfect Competition and Optimal Production Decisions and Uncertainty,” Bell Journal of Economics and Management Science (autumn 1972). “Risk, Return, and Equilibrium: Empirical Tests” (with J. Macbeth), Journal of Political Economy (May–June 1973). “Tests of the Multiperiod Two-Parameter Model” (With J. Macbeth),  Journal of Financial Economics (March 1974). “Long-Term Growth in a Short-Term Market” (with J. Macbeth), Journal of Finance (June 1974) DOI: 10.1111/j.1540-6261.1974.tb01488.x. "The Empirical Relationship between the Dividend and Investment Decisions of Firms," American Economic Review (June 1976). “Short-Term Interest Rates as Predictors of Inflation,” American Economic Review] (June 1975). “Inflation Uncertainty and Expected Returns on Treasury Bills.” Journal of Political Economy (June 1976). “Forward Rates a Predictors of Future Spot Rates,” Journal of Financial Economics (October 1976). “Human Capital and Capital Market Equilibrium” (with G. William Schwert), Journal of Financial Economics (January 1977). “Interest Rates and Inflation: The Message in the Entrails,” American Economic Review (June 1977). “Risk-Adjusted Discount Rates and Capital Budgeting under Uncertainty,” Journal of Financial Economics (August 1977). “Asset Return and Inflation” (with G. William Schwert), Journal of Financial Economics (November 1977). “The Effects of a Firms’s Investment and Financing Decisions on the Welfare of it Securityholders,” American Economic Review (June 1978). "Inflation, Interest and Relative Price” (with G. William Schwert), Journal of Business (April 1979). “Money, Bonds, and Foreign Exchange” (with André Farber), American Economic Review (September 1979). “Banking in the Theory of Finance,” Journal of Monetary Economics (January 1980). “Agency Problem and the Theory of the Firm,” Journal of Political Economy (April 1980). “Stock Returns, Real Activity, Inflation and Money,” American Economic Review (September 1981). “Inflation, Output and Money,” Journal of Business (April 1982). “Inflation, Real Returns and Capital Investments” (with Michael Gibbson), Journal of Monetary Economics (May 1982). "Separation of Ownership and Control" (with Michael Jensen), Journal of Law and Economics (June 1983). "Agency Problems and Residual Claims" (with Michael Jensen), Journal of Law and Economics (June 1983). "Financial Intermediation and Price Level Control," JOurnal of Monetary Economics (July 1983). "A Comparison of Inflation Forecasts" (with Michael Gibbsons), Journal of Monetary Economics (May 1984). "The Information in the Term Structure," Journal of Financial Economics, (December 1984). "Forward and Spot Exchange Rates," Journal of Monetary Economics, (November 1984). "Term Premiums in Bond Returns," Journal of Financial Economics, (December 1984). "What's Different About Banks?," Journal of Monetary Economics, (January 1985). "Organizational Forms and Investment Decisions" (with Michael Jensen), Journal of Financial Economics, (March 1985). "Term Premiums an Default Premiums in Money Markets," Journal of Financial Economics, (September 1986). "Commodity Future Prices" Evidence on Forecast Power and Premiums," (with Kenneth R. French), Journal of Business, (January 1987). "The Information in Long-Maturity Forward Rates," (with Robert R. Bliss), American Economic Review, (September 1987). "Permanent and Temporary Components of Stock Prices," (with Kenneth R. French), Journal of Political Economy, (April 1988). "Dividend Yields and Expected Stock Returns," (with Kenneth R. French), Journal of Financial Economics, 22 (October 1988), 3–25. "Business Cycles and the Behaviour of Metals Prices," (with Kenneth R. French), Journal of Finance, (December 1988)DOI: 10.1111/j.1540-6261.1988.tb03957.x. "Perspective on October 1987, or, What Did we learn from the Crash?" in Black Monday and the Future of Financial Markets, edited by R.W. Kamphuis, Jr.,R.C. Kormendi, and J.W.H. Watson (Homewood: Dow-Jones-Irwin, Inc.), 1989. "Business Conditions and Expected Returns on Stocks and Bonds," (with Kenneth R. French),  Journal of Financial Economics, 25 (November 1989), 23–49. "Contract Costs and Financing Decisions," Journal of Business, 63 (January 1990), S71-91. "Term Structure Forecasts of Interest Rates, Inflation, and Real Returns," Journal of Monetary Economics, 25 (January 1990), 59–76. "Stock Returns, Expected Returns, and Real Activity," Journal of Finance, 45 (September 1990), 1089–1109 DOI: 10.1111/j.1540-6261.1990.tb02428.x. "Time, Salary, and Incentive Payoffs in Labor Contracts," Journal of Labor Economics, 9 (January 1991), 25–44. "Efficient Markets: II," Fiftieth Anniversary Inveited Paper, Journal of Finance, 46 (December 1991), 1575–1617 DOI: 10.1111/j.1540-6261.1991.tb04636.x. "The Cross-Section of Expected Stock Returns," (with Kenneth R. French), Journal of Finance, 47 (June 1992), 427–465, DOI: 10.1111/j.1540-6261.1992.tb04398.x. Winner of the Smeith Breeden Prize for the best paper in the journal during 1992. "Diversification Returns and Asset Contributions", (with David G. Booth), Financial Analysts Journal[dead link], (May/June 1992), 26–32. "Transitory Variation in Investment and GNP", Journal of Monetary Economics, 30 (December 1992), 467–480. "Differences in the Risks and Returns of NYSE and NASD Stocks", (with Kenneth R. French, David G. Booth, and Rex Sinquefield), Financial Analyst Journal, (January/February 1993). "Common Risk Factors in the Returns on Stocks and Bonds," (with Kenneth R. French), Journal of Financial Economics, 33 (February 1993), 3–56. "Size and Book-to-Market Factors in Earnings and Returns," (with Kenneth R. French), Journal of Finance, 50 (March 1995), 131–156, DOI: 10.1111/j.1540-6261.1995.tb05169.x. "Multifactor Explanations of Asset Pricing Anomalies," (with Kenneth R. French), Journal of Finance, 51 (March 1996), 55–84, DOI: 10.1111/j.1540-6261.1996.tb05202.x. "Discounting under Uncertainty," Journal of Business, 69(October 1996), 415–428. "The CAPM Is Wanted, Dead or Alive," (with Kenneth R. French), Journal of Finance, 51 (December 1996), 1947–1958, DOI: 10.1111/j.1540-6261.1996.tb05233.x. "Multifactor Portfolio efficiency and Multifactor Asset Pricing," Journal of Financial and Quantitative Analysis, 31 (December 1996), 441–465. "Industry Cost of Equity," (with Kenneth R. French), Journal of Financial Economics, 43 (February 1997), 153–193. "Determining the Number of Priced State Variables in the ICAPM," Journal of Financial and Quantitative Analysis, 33 (June 1998), 217–231. "Taxes, Financing Decisions, and Firm Value," (with Kenneth R. French), Journal of Finance, 53 (June 1998), 819–843, DOI: 10.1111/0022-1082.00036. "Market Efficiency, Long-Term Returns, and Behavioural Finance," Journal of Financial Economics, 49 (September 1998), 283–306. Winner of the Fama-DFA Prize for the best asset pricing paper in the journal during 1998. "Value versus Growth: The International Evidence," (with Kenneth R. French), Journal of Finance, 53 (December 1998), 1975–1999, DOI: 10.1111/0022-1082.00080. "The Corporate Cost of Capital and the Return on Corporate Investment," (with Kenneth R. French), Journal of Finance, 54 (December 1999), 1939–1967. "Characteristics, Covariances, and Average Returns: 1929–1997," (with James L. Davis and Kenneth R. French), Journal of Finance, 55 (February 2000), 389–406. "Forecasting Profitability and Earnings," (with Kenneth R. French), Journal of Business}, 72 (April 2000), 161–175. "Disappearing Dividends: Changing Firm Characteristics or Lower Propensity to Pay," (with Kenneth R. French), Journal of Financial Economics, 60 (April 2001), 3–43. Jensen Prize (second place) for the best 2001 Paper in corporate finance and organizations. "Testing Tradeoff and Pecking Order Predictions about Dividends and Debt," (with Kenneth R. French), Review of Financial Studies, 15 (Spring 2002), 1–33. "The Equity Premium," (with Kenneth R. French), Journal of Finance, 57 (April 2002), 637–659. "New List: Fundamentals and Survival Rates," (with Kenneth R. French), Journal of Financial Economics, 72 (August 2004), 229–269. "The Capital Asset Pricing Model: Theory and Evidence," (with Kenneth R. French), Journal of Economic Perspective, 18 (Summer 2004), 25–46. "Financing Decisions: Who Issues Stock?," (with Kenneth R. French), Journal of Financial Economics, 76 (June 2005), 549–582. "The Behavior of Interest Rates," Review of Financial Studies, (Summer 2006), 359–379. "Profitability, Investment, and Average Returns,” (with Kenneth R. French), Journal of Financial Economics, 82 (December 2006), 491–518. "Disagreement, Tastes, and Asset Pricing,” (with Kenneth R. French), Journal of Financial Economics, 83 (March 2007), 667–689. "Migration,” (with Kenneth R. French), Financial Analysts Journal, 63, number 3 (May/June 2007), 48–58. Awarded a Graham and Dodd Scroll by the editorial board of the journal. "The Anatomy of Value and Growth Stock Returns,” (with Kenneth R. French), Financial Analysts Journal, 63, number 3 (November 2007), 44–54. Awarded a Graham and Dodd Scroll by the editorial board of the journal. "Dissecting Anomalies,” (with Kenneth R. French), Journal of Finance, 63 (August 2008), 1653–1678. "Average Returns, B/M, and Share Issues,” (with Kenneth R. French) Journal of Finance, 63 (December 2008), 2971–2995. "Luck versus Skill in the Cross-Section of Mutual Fund Returns,” (with Kenneth R. French) Journal of Finance, 65 (October 2010), 1915–1947. ^ Karl Ritter and Malin Rising (2013-10-14). "3 Americans win Nobel prize in economics". Boston Globe. Retrieved 2013-10-14. ^ "Mathematics Genealogy Project". Genealogy.math.ndsu.nodak.edu. Retrieved 2013-10-14. ^ "EFFICIENT CAPITAL MARKETS: A REVIEW OF THEORY AND EMPIRICAL WORK - Malkiel - 2012 - The Journal of Finance - Wiley Online Library". Onlinelibrary.wiley.com. Retrieved 2013-10-14. 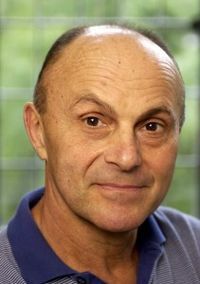 The Fama/French Forum – Observations, opinion, research and links from financial economists Eugene Fama and Kenneth French. Roberts, Russ (January 30, 2012). "Fama on Finance". EconTalk. Library of Economics and Liberty.